TV: Friday, January 18, 2013 – Cooking segment on Alabama Live! with host Judd Davis, WSFA-12 (NBC-affiliate), Montgomery, AL. Watch the Veal Tips with Polenta segment! TV: Friday, October 26, 2012 – Cooking segment on Daytime Alabama with host Wendy Garner, Alabama-13 (NBC affiliate), Birmingham, AL. Watch the Grilled Steak Salad and Sandwiches segment! *TV: Monday, October 22, 2012 – Cooking segment on Home & Family with hosts Mark Steines and Paige Davis, Hallmark Channel, national broadcast. 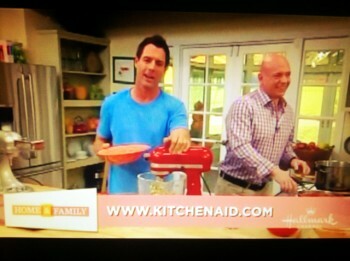 Watch the KitchenAid Spinach Pasta segment! TV: Friday, October 5, 2012 – Cooking segment on Alabama Live! with host Judd Davis, WSFA-12 (NBC-affiliate), Montgomery, AL. Watch the Pumpkin, Apple & Pear Cobbler segment! TV: Monday, September 24, 2012 – Cooking segment on Daytime Alabama with host Wendy Garner, Alabama-13 (NBC affiliate), Birmingham, AL. Watch the Bourbon Shrimp Scampi segment! TV: Friday, September 14, 2012 – Cooking segment on Alabama Live! with host Judd Davis, WSFA-12 (NBC-affiliate) Montgomery, AL. Watch the Farfalle with Mushrooms and Cream segment! TV: Friday, August 17, 2012 – Cooking segment on Alabama Live! with host Judd Davis, WSFA-12 (NBC-affiliate), Montgomery, AL. Watch the Grilled Garden Vegetable Panini segment! TV: Friday, May 4, 2012 – Cooking segment on Alabama Live! with host Judd Davis, WSFA-12 (NBC-affiliate), Montgomery, AL. Watch the “Bourbon Shrimp Scampi” segment! TV: Friday, April 27, 2012 – Cooking segment on Alabama Live! with host Judd Davis, WSFA-12 (NBC-affiliate), Montgomery, AL. Watch the “Grilling Romaine” segment! TV: Friday, April 6, 2012 – Cooking segment on Alabama Live! with host Sally Pitts, WSFA-12 (NBC-affiliate), Montgomery, AL. Watch the “Easter Yogurt Cake” segment! TV: Friday, March 30, 2012 – Cooking segment on Alabama Live! with host Judd Davis, WSFA-12 (NBC-affiliate), Montgomery, AL. Watch the “2 Chicken Salads” segment! TV: Friday, March 16, 2012 – Cooking segment on Alabama Live! with host Judd Davis, WSFA-12 (NBC-affiliate), Montgomery, AL. Watch the “Jam Tart” segment! TV: Friday, March 2, 2012 – Cooking segment on Alabama Live! with host Judd Davis, WSFA-12 (NBC-affiliate), Montgomery, AL. Watch the “Chicken & Olives” segment! TV: Thursday, February 23 2012 – Cooking segment on Alabama Live! with host Judd Davis, WSFA-12 (NBC-affiliate), Montgomery, AL. Watch the “Cauliflower” segment! TV: Friday, February 17, 2012 – Cooking segment on Alabama Live! with host Judd Davis, WSFA-12 (NBC-affiliate), Montgomery, AL. Watch the “Gumbo” segment! TV: Friday, January 20, 2012 – Cooking segment on Alabama Live! with host Tonya Terry, WSFA-12 (NBC-affiliate), Montgomery, AL. Watch the “Saltimbocca” segment! TV: Friday, January 6, 2012 – Cooking segment on Alabama Live! with host Judd Davis, WSFA-12 (NBC-affiliate), Montgomery, AL. Watch the “Minestrone” segment! Radio: Tuesday, October 25, 2011 – Community Focus with host Carolyn Hutcheson, Alabama Public Radio (WTSU, 89.9), Montgomery, AL. Listen Now! *TV: Monday, October 10, 2011 – The Today Show with hosts Kathie Lee Gifford & Hoda Kotb, NBC national broadcast. WATCH NOW! TV: Monday, October 10, 2011 – Alabama Live! with host Tonya Terry, WSFA (NBC affiliate), Montgomery, AL. Watch the interview! Radio: Thursday, July 27, 2011 – Culture Clique with hosts Teri Tenseth and Bill Stoneberg, KQAL FM89.5, Winona State University Radio. Listen Now! Radio: Friday, May 20, 2011 – Here on Earth: Radio Without Borders with host Jean Feraca, Wisconsin Public Radio. Listen Now! TV: Wednesday, April 13, 2011 – KTVU, San Francisco, CA. Watch the video! TV: Saturday, April 9, 2011 – KRON 4, San Francisco, CA. Watch the appearance! Radio: Tuesday, January 18, 2011, 12:00n – Community Focus with host Carolyn Hutcheson, Alabama Public Radio (WTSU, 89.9), Montgomery, AL. Listen Now! Radio: Saturday, December 13 & 18, 2010, featured guest on Kitchen Corner, hosted by Jo Henderson, Evergreen Radio Reading Service, WA. Listen Now! Podcast: Tuesday, December 14, 2010, featured guest on Eye on Italy, hosted by Michelle Fabio, Jessica Spiegel and Sara Rosso. Listen Now! Radio: Thursday, October 21, 2010, featured on The Blue Lifestyle Minute, by host Anthony Dias Blue, KABC radio, Los Angeles, CA. Read the copy! Radio: Wednesday, October 20, 2010, featured on The Blue Lifestyle Minute, by host Anthony Dias Blue, WCBS radio NYC. Read the copy! TV: Wednesday, September 15, 2010, 11:00a – Alabama Live! with host Tonya Terry, Channel 12 (WSFA- NBC affiliate), Montgomery, AL. Watch the interview!